Wiki pages and other artifacts related to the PhantomNet mobile testbed. Directly following this text is a link to the PhantomNet OpenEPC sub-license agreement. Please print, review, sign, scan and then email this agreement to phantomnet-approval@flux.utah.edu to obtain access to PhantomNet's OpenEPC-related materials. Be sure to note your PhantomNet username and project when submitting the agreement. Send questions or concerns about the agreement to this same email address. PhantomNet supports software-defined RAN instances by combining software-defined radio (SDR) hardware and open source eNodeB software. We provide host PCs with USRP B210 RF hardware for the SDR hardware and OpenLTE is one of the supported eNodeB software implementations. This will also have the side effect of loading the USRP firmware if necessary. To prepare the UE side of the RAN, you can operate one of the Nexus 5 handsets with an appropriate SIM card over the air (support for automatic allocation of UE devices and connectivity through the attenuator matrix is planned for the future). You will need to know the IMSI and IMEI of the UE. The IMSI and IMEI must correspond to the values programmed on the UE SIM card. Once the eNodeB is running, the UE should be able to locate the base station and receive PBCH messages. You should be able to connect to the LTE network, and send and receive IPv4 traffic through OpenLTE's emulated EPC. 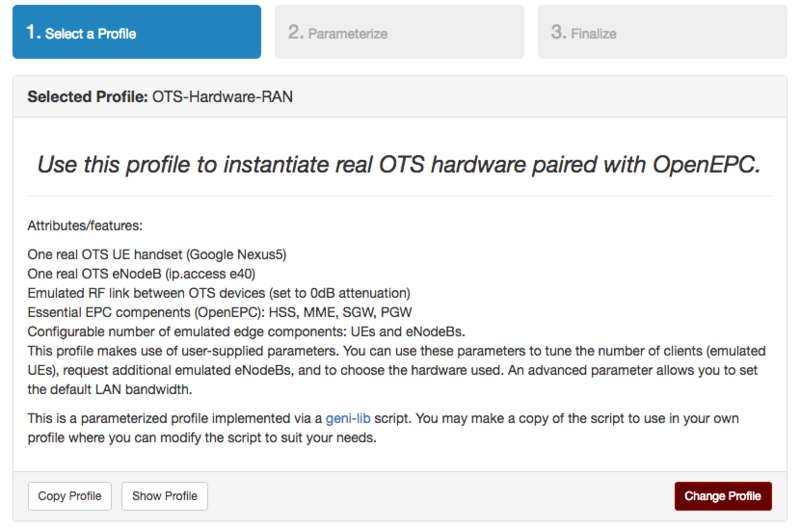 PhantomNet provides commercial eNodeBs for use by experimenters. Specifically, we currently have two ip.access e40 eNodeB devices available. (We expect to have more soon!) Each e40 is a dedicated LTE femtocell which can connect over the air to commodity UEs such as phones, tablets, or LTE modems. In most respects, they are self-configuring. They will automatically boot up and start talking to the OpenEPC infrastructure. We don't allow users to log onto these nodes directly. 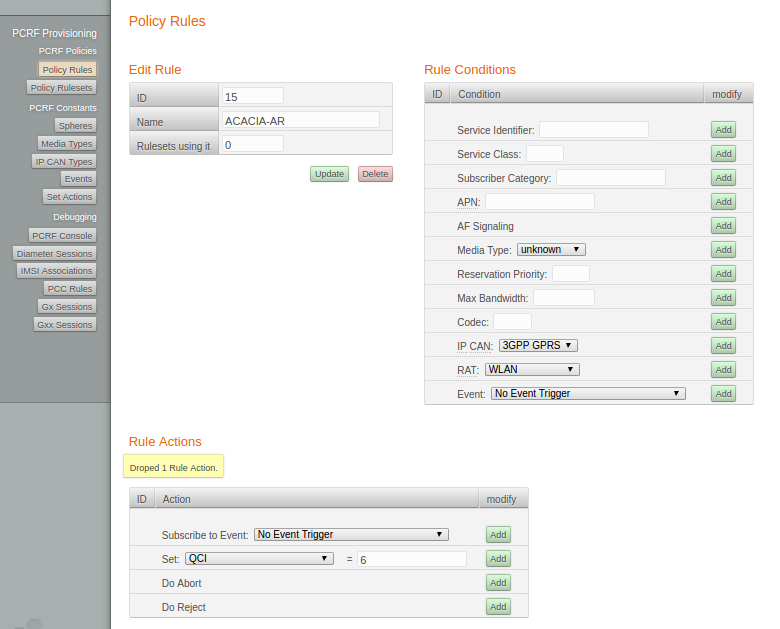 But we still provide an interface for changing some options and enabling logging information. This creates a new node, specifies which e40 is uses, and adds that node to one of the management vlans. The script will contact the e40 at the given IP address and send it the specified configuration file. After the e40 changes the configuration, it will reboot to implement the changes. When the e40 reboots, all connections to both UEs and the MME will be terminated. The configuration file consists of key/value pairs, one per line. Empty lines are permitted, and a line beginning with a '#' is ignored. A debugging interface called FAPI is provided for logging messages in the RAN. Enabling this interface is very resource-intensive and so may perturb the results of your experiment. When enabled, a tcpdump stream is sent to a specified address and port in real time which you can save or analyze. A proprietary parser, described elsewhere, must be used to analyze the stream. At this point, any UE with a key and IMSI in the MME's database can connect through the e40. If you need to reboot the e40, simply reconfigure it and it will automatically reboot. This tutorial will walk you through the steps to build and install test Android applications that control a Facebook application to do certain tasks programmably. In particular, Alice uploads a photo to Facebook every 3 minutes for 10 times and Bob (a friend of Alice on Facebook) continuously updates for the photos. We measure the time to complete a post and the time for a photo to be fetched from Facebook servers. This functionality might be useful for users who want to understand how real applications function under various network conditions, or how mobile network protocol changes impact a smartphone application. This tutorial will be done in the PhantomNet (https://www.phantomnet.org) testbed via PhantomNet portal and geni-lib, using two Nexus 7 tablets attached to an Ip.access E-40 small cell and a OPEN EPC core network instant. apk: includes Facebook apks and scripts to re-sign the apk. scripts: includes the scripts for the tutorial. test-blackbox: includes Java source code of the test applications. Figure 1 shows the topology of the experiment in PhantomNet. In the radio side of the network, two Nexus 7 tablets running Android 4.4.2 are attached to a Ip.Access (E-40) LTE small cell base station via LTE. In the core side of the network, an OpenEPC instance consists of EPC components needed for a LTE/ECP network (i.e, SGW, MME, PGW, HSS). PGW is the gateway connecting the core network to the Internet (and Facebook servers). PhantomNet allows users to create a profile that specifies topology, parameters, and set up scripts. After having a profile, multiple experiements could be initiated using the profile, each experiment will be an instance of the profile. In this tutorial, we will create a profile using Geni-lib source code in PhantomNet portal. Step 1: Go to PhantomNet website at https://phantomnet.org and log in. Step 2: In your personal homepage, create a profile by select "Create Profile" under "Actions". step 3: Assign a name for your profile. Then click on "Source" next to "Topology" button to specify the profile using a Geni-lib script. step 4: Upload a Geni-lib Python script to specify the topology of the profile. Here is the geni-lib script that specifies the topology for our tutorial. Copy and paste the geni-lib script and click "Upload". Click "Accept" to finish uploading. step 5: After uploading the geni-lib script, an Rspec will be generated for your profile. The Rspec specifies the resources (e.g., nodes, links) in an XML format. To see how the RSpec looks like, click on "XML" button in the "Create Profile" page (note that the XML is read-only, if you want to modify the topology, you would need to modify the geni-lib script). Step 1: To select the profile you have created, click on "Actions"->"My Profiles". Click on the profile that you created. Step 2: Instatiate an experiment by click on "Instantiate" button. Click "Next" in the Select Profile page. Click "Next" in the Paramiterize page. Put a name for your experiment in the Finalize page and then click "Finish". 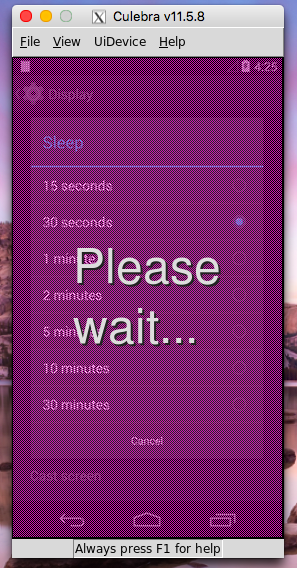 Step 3: After clicking "Finish" it might take up to 10 minutes for your experiment to be created and ready. You can see your experiment being instantiated on the flight. Once the experiment is ready, click on "List View" for ssh information of how to access your nodes. After this step, a re-signed apk will be created in the apk folder named apk/signed_Facebook- 25.0.0.19.30.apk. 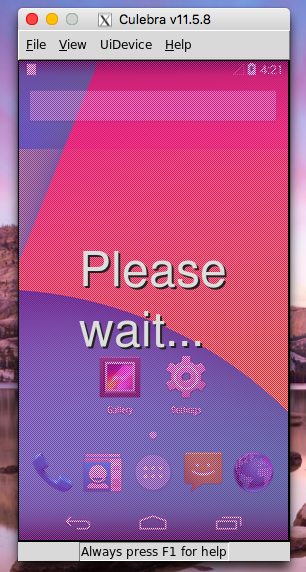 We’ll use this apk throughout this tutorial. 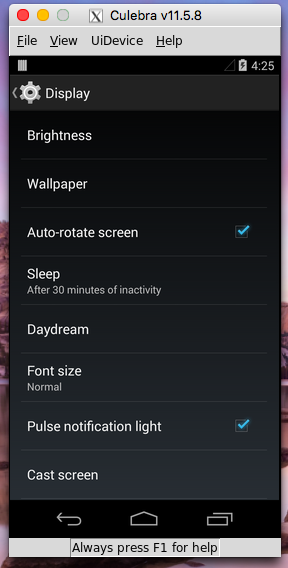 We need to install the resigned Facebook apk to the 2 Nexus 5. 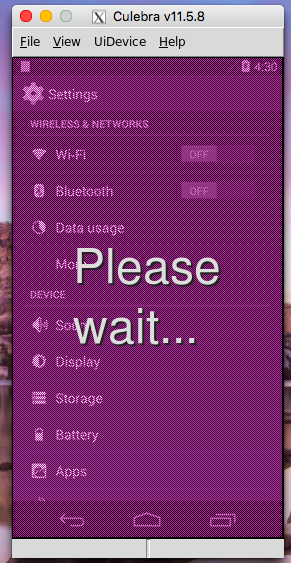 We will use "adb" interface to do this. We need two test applications for Alice and Bob that launch and control Facebook apk to do predefined tasks: Alice uploads a photo to Facebook and Bob continuously fetches the photo. The two applications are Android test applications and their apk could be found in apk/alice.apk and apk/bob.apk. Note: If you would like to see how the apks were implemented, please refer to test-blackbox folder. In short, Alice opens the Facebook apk, touches on update status button and post a photo every 3 minutes for 10 times; Bob opens Facebook apk, scrolls down the main feed screen to fetch new updates from Alice. During execution, Alice measures the time to post a photo (i.e, the elapsed time between touching the post button and the moment the progress bar disappears); Bob records the moment that photo appears on Bob’s main feed. The fetching time is the elapsed time between the moment the photo was posted by Alice and the moment it appears on Bob’s screen. The source code for Alice and Bob apk are in "/test-blackbox/alice/src/com/testAlice/" and "/test-blackbox/bob/src/com/testBob/". 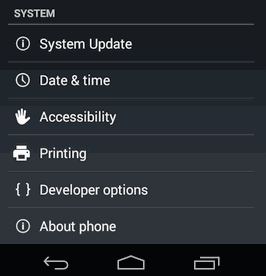 The tutorial assumes you already logged into the Facebook accounts on the Nexus 5 devices so that the scripts will post Facebook status automatically without the log-in actions. Therefore, you will need to create 2 Facebook accounts manually (e.g., using your own computer and the Facebook website). The accounts could have any name as you wish. After having the account, log-in to Facebook accounts on the Nexus devices. A way to log-in to Facebook is via a GUI interaction with the devices using Culebra. 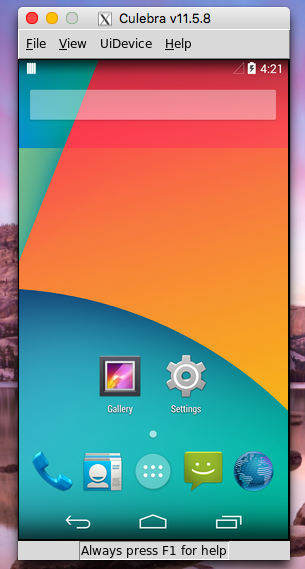 A tutorial of how to use Culebra to interact with Nexus 5 via GUI is here. During the execution of this script, if you have a Culebra GUI window open, you will see the Alice and Bob apks control the Facebook apk to post/fetch status. The output of this script is status|post time|fetch time, where post time is the elapsed time to post a photo on Alice in millisecond and fetch time is the time for Bob to fetch the photo in millisecond. This tutorial showed you the steps to run test applications to control Facebook apk and observe the interactions between Facebook and a LTE/EPC network. Similarly, you can build your own test applications to control other apk such as Youtube, Twitter to understand how the apps interact with the LTE/EPC network or how the LTE/EPC network performance could affect the apps. This document shows you how to interact with hardware UE nodes in PhantomNet. Working with hardware UE devices in PhantomNet is a bit different from developing locally. 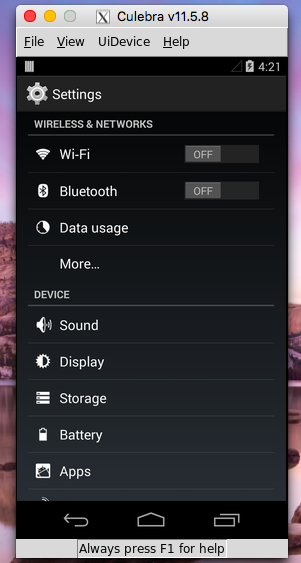 Normally when developing with an Android device, you would plug the device into the USB port of your local computer and interact with it using tools such as ADB. Since the UE devices in PhantomNet are in a remote location, the PhantomNet testbed sets up remote access. 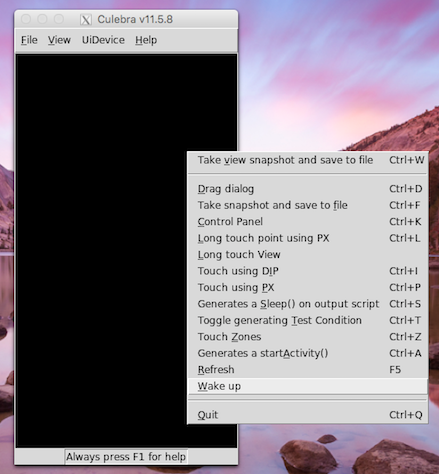 With a few minor adjustments, you should be able to work with the UE devices in PhantomNet just as you would with local devices attached to your computer. These profiles request a dedicated ADB target node, and set an attribute on any UE nodes in the profile script to point them at this node. When an experiment is instantiated from such a profile, the PhantomNet setup machinery forwards a connection from the adbd daemon running on the UE through the infrastructure host it is connected to (via USB). It only allows the ADB target node to connect to this forwarded connection. 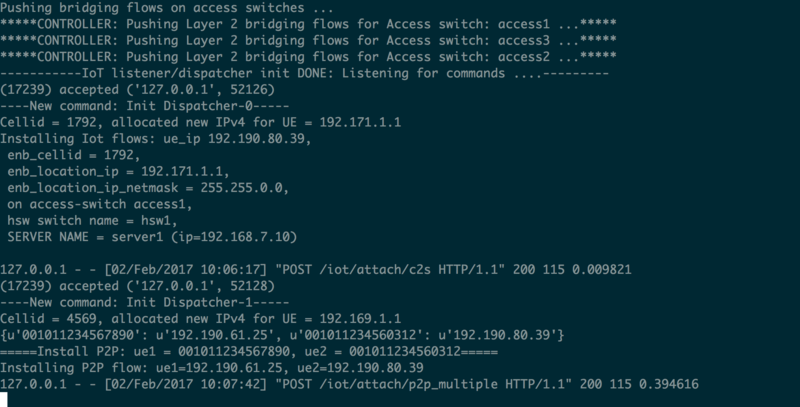 In other words, the infrastructure host connected to the UE listens on a dynamic TCP port for connections from an ADB target, and forwards this traffic on to the adbd daemon running on the device. The ADB target node is further setup to load and run a disk image that contains tools useful for interacting with Android UE devices. A list of these tools can be found below. Included are unmodified ADB from the Android Open Source Project, and a PhantomNet-specific script called pnadb that understands the nicknames given to the UE devices (from the profile script/RSpec). Where GLOBALS.UE_HWTYPE is set near the top of the script to a type available in the PhantomNet testbed (likely set to "nexus5"). The UE is also set to run a specific OS image (GLOBALS.UE_IMG); this will be set to something like "ANDROID444-STD" (Android 4.4.4). Next, the script has a stanza that sets the adb_target attribute to "adb-tgt", which is the nickname for the ADB target node (see the prior snippet above). The last line in the code snippet above allocates an interface object that is used in another part of the profile script to request an "RF link" connection to another device, typically an eNodeB of some sort (off-the-shelf or SDR). These RF links and the attenuation matrix that they run through are described in the RF Environment (ADD LINK!) document. (Note the long delay for the first ping packet; the device was idle prior to running ping, so had to re-attach to the network.) We can also use other tools that interact via ADB, such as monkeyrunner (not installed by default) and culebra from the AndroidViewClient project (which is installed in the PNTOOLS image). This is a PhantomNet-specific script that can list the mapping from node nickname to remote ADB console:port. It can also connect ADB on the node to one or more (or all) UE devices in your experiment. Run without arguments to get a usage message. The essential tool for interacting with Android devices, from the Android Open Source Project. This is installed via an Ubuntu (apt) package. Invoke without arguments to get a usage message. The official documentation is here. 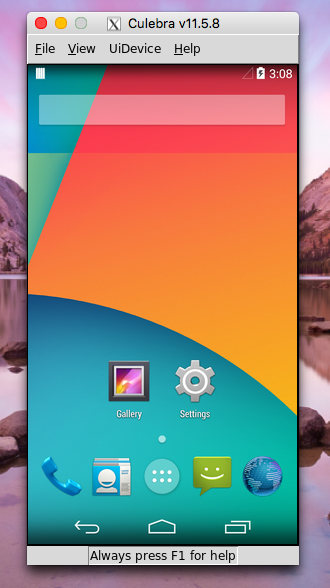 Tools such as ext2simg, make_ext4fs, simg2img, etc., from the Android Open Source Project. 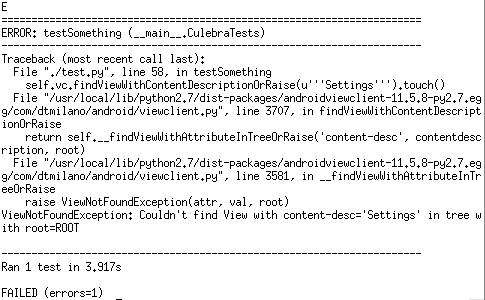 The AndroidViewClient tools and library are installed, which include the culebra and dump scripts. 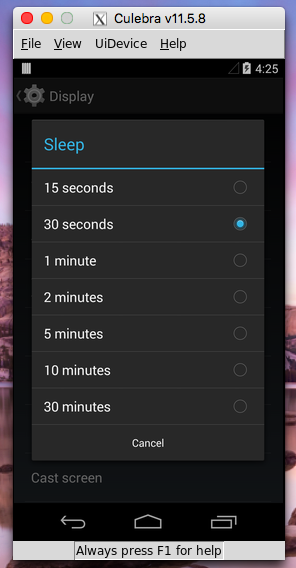 culebra lets you interact with and record macros for the Android GUI. The macros are similar to those you can create using monkeyrunner. Learn more about AndroidViewClient here. After setting things up, this script will spit out a URL you can paste into your browser. A ctrl-C sent to the shell where you ran this script will kill the running VNC/X server. This X session is handy to have to run things like culebra without needing to setup and forward an X session from your own machine. In the example profile above, we show how a geni-lib driven PhantomNet profile can setup ADB access on a designated target node in your experiment. You cannot connect with ADB from any other machine; the infrastructure host is setup to only allow connections from the host set in the adb_target attribute. For example, the OpenSSH client can forward your local X session to the ADB target (or other) node in your experiment. The string to use to connect with OpenSSH can be found under the "List View" tab for your experiment from within the PhantomNet Portal. Alternateively, you can setup a browser-accessible X session by running the script mentioned in the "Tools of interest" section above. Commands run via the shell interface will run as the root user on the UE. You must reconnect using the pnadb command as shown above. It may take a minute for the infrastructure host attached to the UE to reestablish the forwarding setup such that you can connect again. 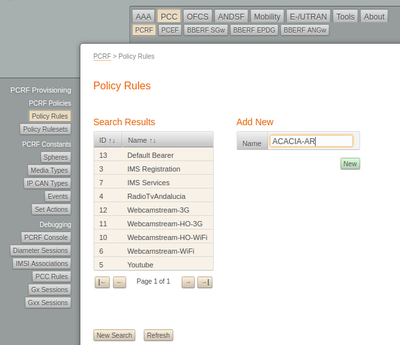 The ACACIA profile makes use of OpenEPC for the core part of the network. In order to use OpenEPC as part of the PhantomNet testbed, you first need to sign an OpenEPC sub-license agreement following the instructions provided here. You MUST follow this step, otherwise you will be unable to instantiate the ACACiA profile and you will get an error message mentioning that you have insufficient permissions to use the OpenEPC binaries. ACACIA is a service abstraction framework that adopts a holistic end-to-end approach to enabling low latency continuous interactive (CI) services over mobile networks offered by mobile network providers. ACACIA leverages client context information, namely proximity to landmarks and user interests, along with the SDN/NFV capabilities of the core network, to optimize both network and application processing latencies. ACACIA consists of three components to enable CI application over mobile network. This tutorial is based on the work done for the ACACIA framework, published in CoNEXT 2016 (paper link). 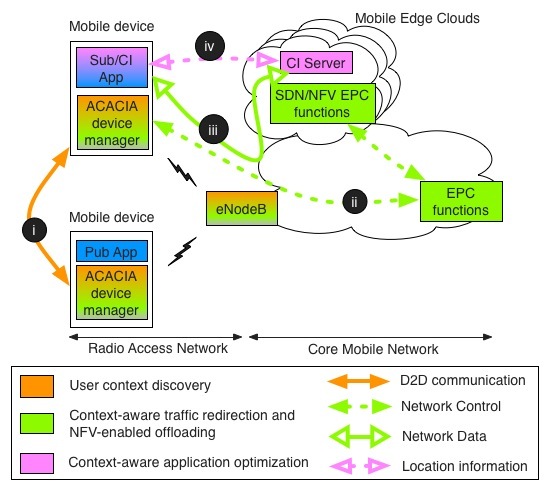 Specifically, the profile provides the ACACIA Mobile Edge Network component, which is designed to enable Mobile Edge Computing (MEC) in a mobile network. You first need to create a new experiment by logging in to the PhantomNet web UI. If you do not have any current experiments running you should land on the instantiate page by default, otherwise you can click on "Actions" and select "Start Experiment" from the drop down menu. Click on the "Change Profile" button. To find the profile we will use for this tutorial, type "acacia-mec" into the search box. Select "acacia-mec" from the resulting list by clicking on it. This will show a description of the selected profile. Next click on the "Select Profile" button which will take you back to the "1. Select a Profile" page. Click "Next" to reach the "2. Parameterize" page. 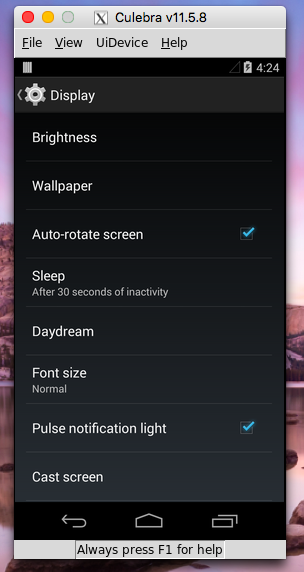 For this tutorial we will stay with the default options, so simply select "Next" to reach the "3. Finalize" page. In this page you will see the topology of the experiment and you need to select the project in which the experiment should be created (assuming you have access to more than one projects). You might optionally also give your experiment a name at this point by typing into the "Name" field. Click "Finish". PhantomNet will now go through the process of creating and setting up your experiment (this can take some time). When your experiment goes beyond the "created" state, the web interface will show more information of the resources allocated for the experiment and the current state of each node. For example the "Topology View" tab will show the topology of your experiment and hovering over a node will show its current state. Also, pay attention to the “List View” tab which shows you how to connect to each node of the experiment using ssh. 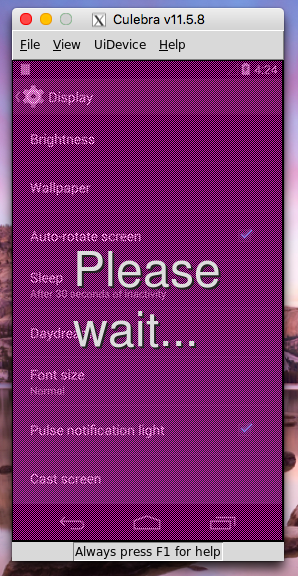 With ACACIA profile, most of steps are executed automatically when the experiment is started. However, you need to run some steps manually. PGWC needs PGWU information for control PGWU's data plane. So, you need to configure the information before starting an experiment. Once you run below command, you do not need to run it again. Since this command needs to access to "pgwu" node from "sgwc-pgwc", you should use "-A" option when you access to "sgwc-pgwc" node with ssh command (e.g., ssh -A <username>@<sgwc-pgwc-node>). 2. Define your own service to run on edge clouds. Please refer to ACACIA service registration page to define your own service. * Sometimes, the UE does not connect to OpenEPC properly due to various reasons. In this case, you can simply re-run all components ( You can reboot ip.access eNodeB in "Topology" tab of the experiment by clicking "renb1" icon and select "Reboot"). 4. 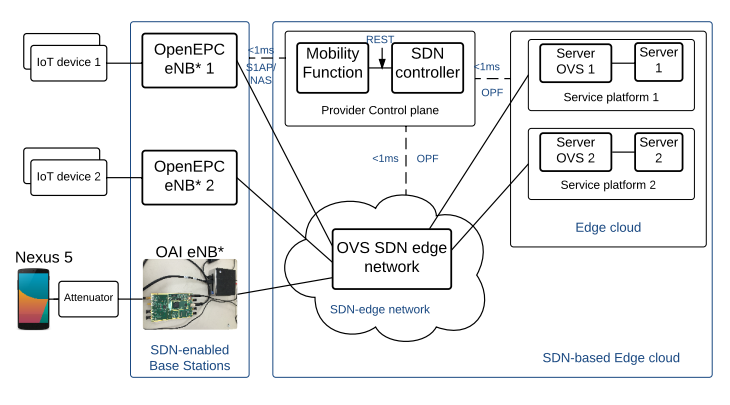 Set up Local LTE SGW-U and PGW-U and run a SDN controller to control them. To run your service on the edge cloud, we need to run local SGW-U and PGW-U on the edge cloud. Connect via ssh to the node “sguw1” and "pgwu1" (Find the appropriate ssh command from the “List View” tab of the experiment). In "sgwu1" node, you run the script to set up local SGW-U. In "pgwu1" node, you run the script to set up a local PGW-U. When your UE has an initial connection ( in step 1 ), you can request the connectivity between the UE and your service server on edge clouds. In "epc" node, you can attach an application function (AF) server with "crx.new.noid" command which needs <UE IP> <CI Server IP> <Service Name>. Or, you can use "android-af-call" script in /opt/acacia-gw/acacia/helper/ directory in "epc", "sgwc-pgwc", or "mme" node. After this command, all procedures explained in section 3 based on protocols in section 4 are executed. Now, the UE has two different bearers. One is a basic internet connection and the other is only for your service server connection. 6. The UE can interect with your service server via the dedicated bearer. 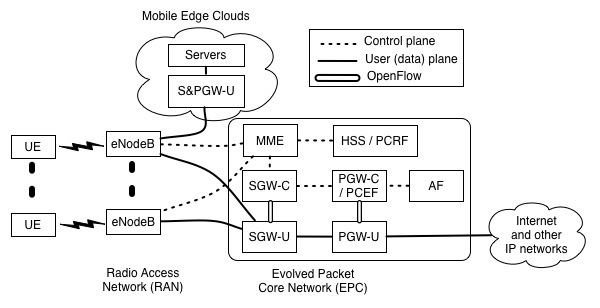 The figure above shows the detailed ACACIA Mobile Edge Network procedure. Initially, the User Equipment (UE) is connected to the mobile network via a default bearer. Send a MEC connectivity request from the CI app on the UE to the MEC Registration Server (MRS). 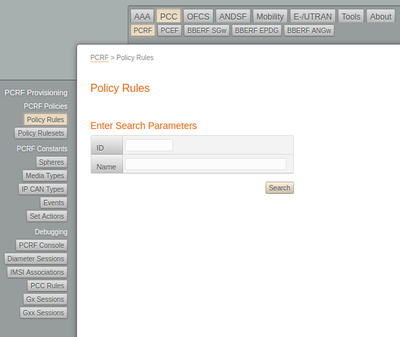 Create policy rules for the user’s CI app. 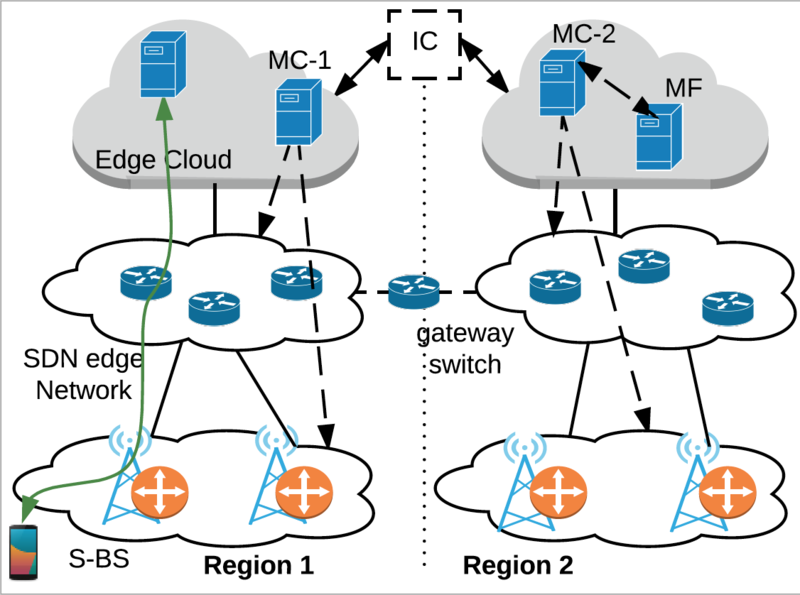 Setup a dedicated bearer in network for the user’s CI App through GW-Cs, MME, eNodeb and LTE modem in mobile device. 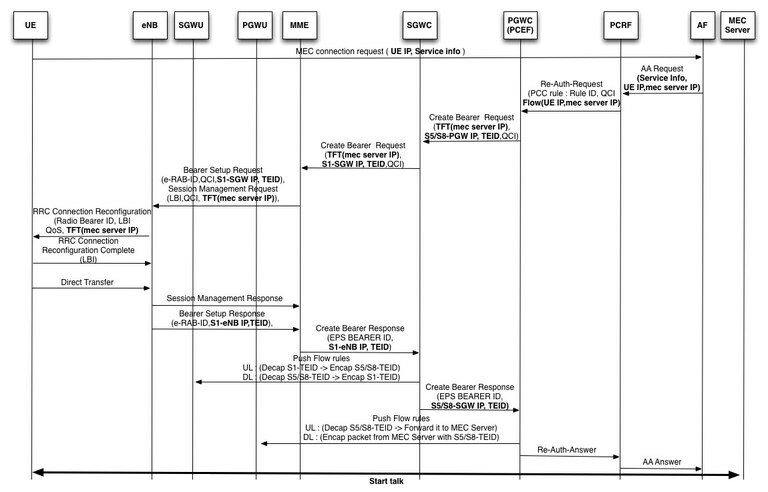 Setup flow rules in local S&PGW-U for the dedicated bearer. The CI app interacts with CI server. This sequence diagram shows what protocols and messages are exchanged when you use ACACIA Mobile Edge Network. It is essentially the same as the procedure to trigger a dedicated bearer in LTE network. The figures below show screenshots when we use the ACACIA profile. You can find all tcpdump files (you can find them /opt/acacia-gw/acacia-tcpdump/ directory in sgwu1 or pgwu1 node) which contains the control messages involved in this interaction. The profile only supports one local SGWU and PGWU. We will extend the profile to support multiple local GWUs. After "bearer release" happens due to a radio idle timeout, the local SGW-U is not updated. So, it loses the dedicated bearer connection. We will support this function soon. Delete "dedicated bearer" connection on demand. 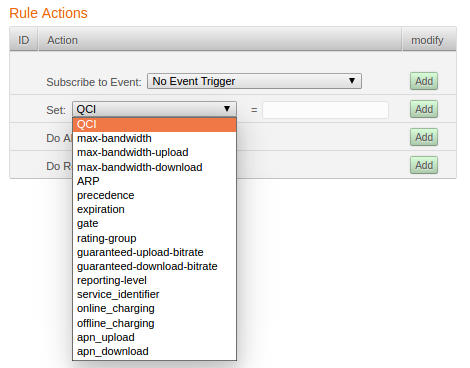 You can specify your service name and its QCI value in a current profile. We plan to support more parameters for better traffic control for the service. Combine our extensions with Open Air Interface (OAI) to make all component public. It will ask id and passwd to login the page. We use admin for id and epc for passwd. 1. 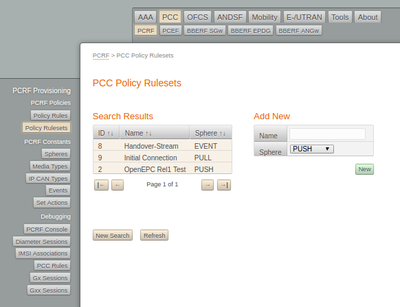 Click "PCC" -> "PCRF" -> "Policy Rules" -> "Search" buttons. 2. Add your service ( e.g., "ACACIA-AR" ) in "Name" blank and click "New" button. 3. Set "QCI" values from 6 to 9 and click "Update" button. 4. 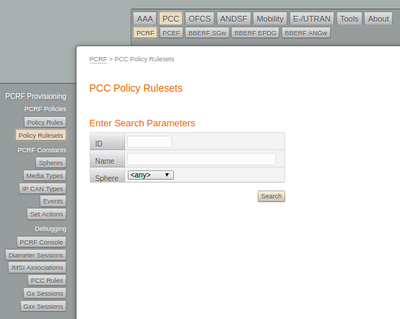 Click "PCC" -> "PCRF" -> "Policy Rulesets" -> "Search" buttons. 5. Click "OpenEPC Rel1 Test"
6. 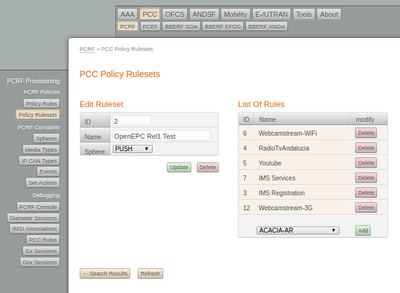 Select "ACACIA-AR" in List Of Rules and click "Add" button and "Update" button. This tutorial shows how to use S1 handover with emulated UE and eNBs and MME Relocation in PhantomNet. To get started, first instantiate an experiment with the inter-mme-HO profile via PhantomNet portal. When creating the experiment, increase the "Number of eNodeB nodes" to 2 and "Node Hardware Type" to any available physical machine type. In this tutorial, your client is initially connected to enb1 and mme1, and moves from enb1&mme1 to enb2&mme2. If you don't know how to perform the initial UE attachment with OpenEPC, please first go through the OpenEPC Tutorial. S1 handover with emulated UE and eNBs and MME relocation needs some manual steps since emulated UE and eNBs in OpenEPC do not have the required RAN procedures for handover. However, the procedures among source, target eNBs and MMEs, and SGW are the same as S1 handover standard. For S1 handover with MME relocation, you need to know client imsi, enodeb and MME information for S1 handover. This information is listed below. ii) eNodeB information (you can check enodeb's tac and cell id information in /opt/OpenEPC/etc/enodeb.xml). iii) MMEs information (you can check mme information in /opt/OpenEPC/etc/mme.xml). iv) Files for EPC function configurations. You will need to download them for the next step (Configurations for testing S1 handover with MME relocation). 1. Used in mme-ip.sh to get net-d, net-b and mgmt interface. 2. Used to get net_c interface in eNB2. To test S1 handover with MME relocation, you need to set up information shown above in each node. In addition, there are limitations on OpenEPC implementation to test S1 handover with MME relocation. For example, first run eNB1 and MME1 without running eNB2 and MME2 and do an initial attachment from UE. So, you should follow below procedures to test it. # Trigger an attachment request. v) After UE attachments, you need to configure ENB2 and MME2. First set up ENB2. # 2. eth5 is used for net_c (an-lte) interface in this experiment (In your experiments, the output will be different). # Replace "net_c" with "eth5"
# Set up IP address for a second MME since MME2 was defined as "ANY" roles in this profile . So it does not have correct IP addresses for net-d, net-b and mgmt. # You need to put get_interface_map.pl and mme-ip.sh in the same directory. # In mme1, attach to mme console. # In mme2, attach to mme console. ii) Check MME configurations in MME's console. You need to check GUMMEI, Served TA, and TA MCC information from MME's console with the information listed in "Prerequisite configurations for S1 handover with MME relocation"
With this command, OpenEPC proceeds with the "Handover Command" procedure in S1 handover. i) Even though all procedures are done and CLIENT1 UE can send traffic to the internet through ENB2, MME1 dies after the S1 handover completes. There are apparently OpenEPC implementation issues in the last S1HO procedure which cause the MME1 function to crash. ii) In a future revision, we will demonstrate how to elide most of the manual steps (configurations for testing S1 handover with MME relocation) with pre/post-hooks scripts.